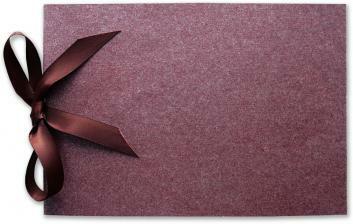 Plum Chocolate RSVP set includes the petite A1 softwhite recycled envelope and matching RSVP card. RSVP card in Softwhite cardstock 5x3.5 inches. Papers for both the RSVP card and envelope come from Italy. If you print, the rsvp card comes 4 to a sheet, so you print and cut. If we print, we cut to 5x3.5 inches. Templates for both parts comes with the kit. Softwhite 50% postconsumer recycled paper cardstock. 80 lbs weight and 8.5x11 inches. You can print 4 direction cards or reception cards on a sheet. ****SOLD OUT*** Thank you :) LIMITED EDITION - when this design sells out, it is no longer available. **NO FREE SAMPLE ** -- only paper swatches available. DIY Booklet Wedding Invitation made from metallic plum colored handmade paper. Interior of paper portfolio is brown, and ties with a matching brown satin ribbon. Textured and incandescent. Booklet is diecut and scored, with a handsome pocket for rsvp set or enclosures. Booklet style invitation sheet - perfect for 2 language wedding invitations. Easy assembly. Modern landscape design and rich colors. This is an eco friendly design. The paper is treefree but the booklet is coated with a metallic finish. You print on 100% cotton paper. (tree free). Envelopes are 100% recycled with 50% PCW content. Envelope: Softwhite recycled paper envelope. Invitation Sheet:Softwhite cotton rag paper. Prints laser or inkjet. Wrapper:Handmade paper booklet - diecut and scored with pocket. Envelope:Soft white recycled paper A7 standard size.